LEXIE CANNES STATE OF TRANS — The number of reported trans deaths of late is sobering. But is this an uptick in actual murders? 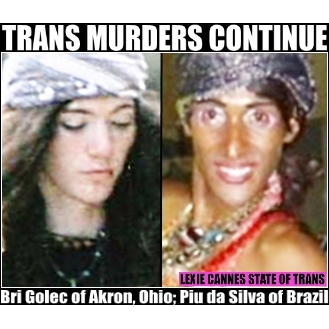 Although stats point to two trans murders every three days worldwide, it is too early to tell, especially now with the recent demise of an organization running a comprehensive trans violence tracking program. For sure though, reported deaths are up, especially in the United States. In Akron, Ohio, trans woman Bri Golec was apparently killed by her father during an apparent domestic dispute in their home on Feb. 13. The victim’s father, Kevin Golec, was charged with murder and domestic violence. Prior to the discovery of Bri’s body, an emergency call from the home spoke of robbery and involvement of a “cult.” Trans activists believe the “cult” comment was in reference to the trans community and the father was trying to cover up his crime. Police say there was no robbery. In Rio de Janeiro, Brazil, a disfigured body was identified as trans woman Piu da Silva according to a report in Gay Star News. She was found January 24, a day after a video showing the victim being tortured surfaced. Relatives then searched the area shown in the video and found her body. a systematic extermination of trans people. When will we start fighting back, and protect our community? The recent amount of violence toward trans people might be a response to the inroads toward freedom made by the L.G.B. community. The transgender community might be the people targeted because we’re the most visible. Yes justibj, you’re right we must fight back, through self-defense when we’re targeted, and also through laws and legislative action that is enforceable. All the pro-transgender laws in the world are just so many words, if the law enforcement officials don’t do their jobs. Education is another factor in the fact that the transgender community is a target. WE MUST show the people we encounter that we’re not cartoon characters, or the negative personas shown by the mass media. Yep, we’re the new target.